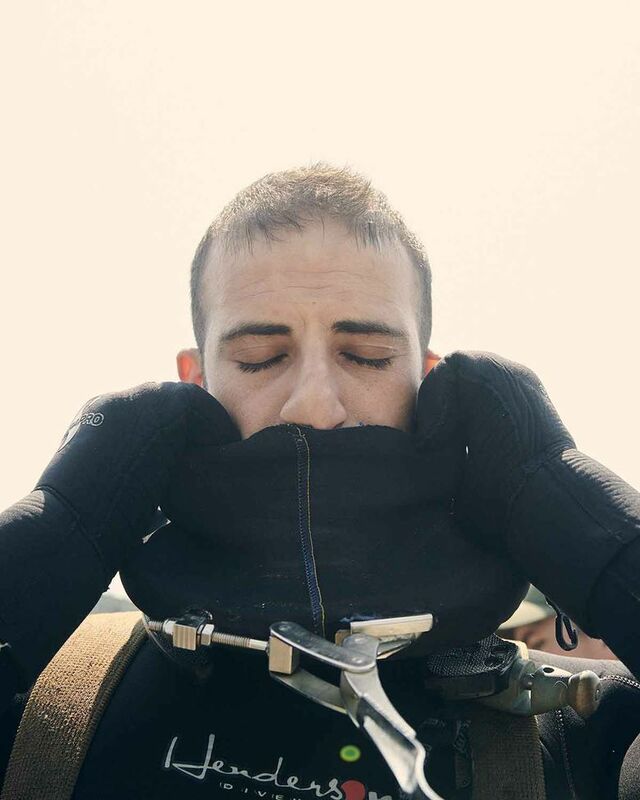 Joe Finora, 30, is a marine engineer diver at Jacobs in New York City. Q: You spend a lot of time working underwater. What does your job involve? A: I’ve inspected structures that include a cruise line’s passenger terminal, a private marina’s floating dock system, a passenger ferry terminal and a petroleum terminal’s off-loading structure. I dive in New York a lot, but I’ve been all over the world. Q: Did you always want to work in this field? A: I grew up in Mattituck on the North Fork of Long Island and was always fishing and swimming as a kid, but I didn’t consider diving until grad school. I got a bachelor’s in civil engineering and a master’s in maritime systems from Stevens Institute of Technology in Hoboken. During my master’s program, I worked as a structural engineer next to a dive group at a marine engineering firm and was attracted to what the divers did, so I moved over to that group and got licensed to dive. Jacobs bought CH2M, the company I worked for, last year. Q: Do friends think your job is glamorous? A: Some people think I’m lucky, but on a cold winter morning when it’s dark outside I don’t relish getting out of bed and going to work. We have extremely warm dive suits for cold water, but still, the water can be choppy and the weather can be stormy. It’s like any job — it has its ups and downs. Q: Do you see a lot of marine life close up? A: I’ve been within feet of whales and dolphins. At the start of a day in Southern California, I had just entered the water and was about 20 feet down when a small shark passed through my legs. I’ve also encountered a couple of unexploded bombs and had the United States Coast Guard point a gun at me on the East River in New York during the preparation for a pope’s visit. Security has tightened everywhere since 9/11, even in the water. Q: Do you dive alone? A: We work in teams that have a minimum of three. 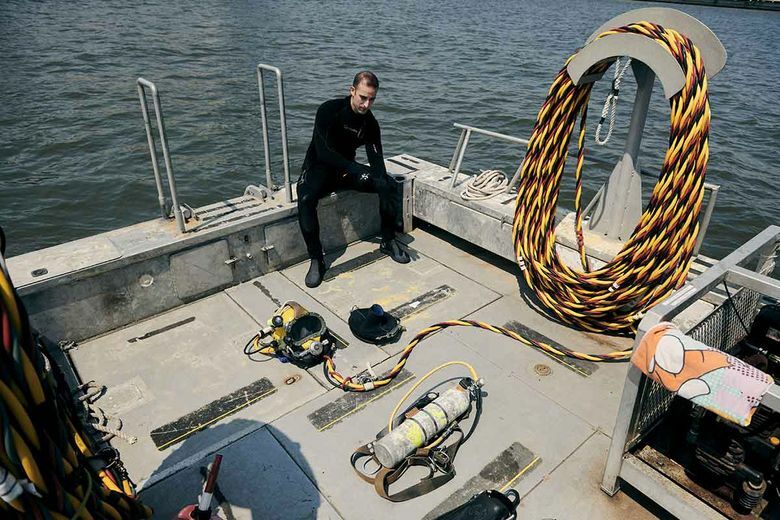 An engineer dives; a person we call a tender takes care of the equipment, such as the air supply and the communications cable; and a third person communicates with the diver by radio and takes notes as the diver relays information about pilings or a retaining wall, for example. We typically rotate positions throughout the day. Q: Do you remember your first dive? A: Very clearly. I was in a murky area beneath a pier in New York Harbor and could hardly see a foot in front of me. All of a sudden, something got me right between the eyes. It hit me so hard my head was thrown back. When I was able to focus, I was staring into the eyes of this disgusting, brown, slimy-looking fish that was so close I saw teeth. It looked as stunned as I was. I screamed I was so scared. When I surfaced, I told my team it was about five or six feet long. A colleague familiar with the fish in the area showed me a photo on his cellphone and asked if that was the fish. It was, and it was only the size of a football. I lost credibility that day.